Dr. Craig is a one-of-a-kind dentist. I hate dental work more than anyone I know, and in his caring hands, I am finally on the road to good dental health...I have never been in any kind of pain. He simply won't allow it. For anyone who hates going to the dentist, Dr. Craig is the man to go to. He made me feel so comfortable, and he is so skilled at what he does. I needed to have a root canal, but I had heard horrific stories. However, I am now so happy with the results. I moved from Denver about a year ago to Grand Junction. I had just started my Invisalign treatments with Summerbrook Dental. I actually drive the 4 hour drive every 2 months just to go to them. I didn't want to switch dentists for fear that the next one wouldn't be as good as they are. It’s helpful to think of a tooth like a cupcake with icing and a cream filling. The icing is the outermost layer and is the enamel, or outermost layer of your tooth. If a cavity or crack is isolated only in the enamel and has not penetrated any deeper, often times I do not recommend treating the tooth because a cavity that is only in the enamel is reversible with proper home care and fluoride! How many other dentists in Aurora, CO will tell you that your cavity should not be filled because it’s reversible? However, if a cavity or crack gets under the icing and into the cake, which is called the Dentin, I recommend treating the tooth because these cavities are NOT reversible. However, often cavities and cracks that are in the dentin don’t hurt because the cavity or cracks have not gone deep enough to affect the cream center of the cupcake, which is where the nerve and the blood vessels and the living tissue of the tooth lives. Even though these problems are often painless, fixing them early is much more cost effective and usually also painless dentistry! If patients wait until the cavity or crack gets so deep that the nerve in the tooth dies or the tooth breaks in half, there is much more pain. In fact, what I always tell patients is that if they have a problem in a tooth that is irreversible, even if it’s not hurting, it is never going to be less expensive or less painful to fix that tooth than it is right now. Most of our patients come to us initially because they find out that we do free consultations. I don’t believe you should have to pay just to find out if something is wrong, and I believe you ought to be able to meet an aurora, CO dentist to see if you like the office BEFORE you pay! If you think you might have a cavity and would like to see a dentist in Aurora, CO for a free consultation to see if your cavity is in the icing, the cake or the cream filling, call 303-693-1215 or fill out our contact form to schedule your free consultation and to learn more about how dentistry can be painless! 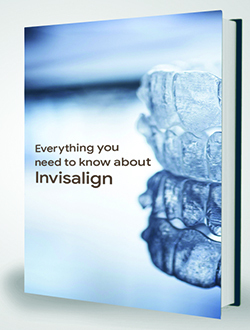 The complete guide on how Invisalign can straighten your teeth without the need for braces. This book contains everything you need to know. Porcelain Veneers vs Crowns: What’s the Difference?